Note: this summary was generated Jan 10, 2011. Please see my publications for newer papers. In persistent monitoring problems, we use groups of robots to collect data in dynamically changing environments. Robots are equipped with limited range sensors, and are tasked with continually monitoring a changing environment. We have developed controllers that enable mobile robots to carry out persistent monitoring and cleaning tasks over a changing environment. The changing environment is modeled as a field which grows in locations that are not within range of a robot, and decreases in locations that are within range of a robot. The robots travel on given closed paths, and the speed of the robot along the path must be controlled so as to prevent the field from growing too large at any location. The field can be thought of as either a material that must be cleaned---such as oil in the ocean, or dirt on the floor---or as the uncertainty of the robot's estimate of the environment at each point. We have developed controllers which are guaranteed to keep the field bounded. The controllers can be computed using a simple linear program. We can incorporate realistic limitations on robot performance such as speed bounds and sensing bounds. The movie on the left shows three robots monitoring a changing environment. Each robot's path is shown, and it is controlling its speed along the path. The field is given by the surface. For more information, see our work on persistent monitoring and cleaning in changing environments. I am interested in planning paths for underwater gliders to persistently monitor and sample regions of the ocean. We have looked at aiding ocean scientists in collecting high-value data for studying ocean events of scientific and environmental interest, such as the occurrence of harmful algal blooms. Our path planner optimizes a cost function that blends two competing factors: it maximizes the information value of the path, while minimizing the deviation from the path due to ocean currents. We have also developed a speed control algorithm then optimizes the speed along the planned path so that higher resolution samples are collected in areas of higher information value. The resulting paths are closed circuits that can be repeatedly traversed to collect long term ocean data in dynamic environments. 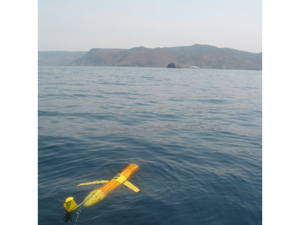 The algorithms were tested during sea trials on an underwater glider operating off the coast of southern California over the course of several weeks. The results show significant improvements in data resolution and path reliability compared to a sampling path that is typically used in the region. For more information, see our work on persistent ocean monitoring. A key question in robots is to automatically generate optimal robot paths satisfying high level mission specifications. For example, looking at the figure, we may be interested in commanding a robot to "Repeatedly gather data at locations g1, g2, and g2. Upload data at either u1 or u2 after each data-gather. Follow the road rules, and avoid the road connecting i4 to i2"
We have addressed this problem by modelling the motion of the robot in the environment as a weighted transition system. The mission can be specified in linear temporal logic (LTL) describing desired robot behaviours in the environment. The mission specification contains an optimizing proposition which must be repeatedly satisfied. The cost function that we seek to minimize is the maximum time between satisfying instances of the optimizing proposition. For every environment model, and for LTL formula, our method computes a robot path which minimizes the cost function. The movie on the left shows a real robot executing a motion planning generated by our algorithm. The robot is performing a data gathering mission in a road network. For more information, see our work on optimal motion planning with temporal constraints. 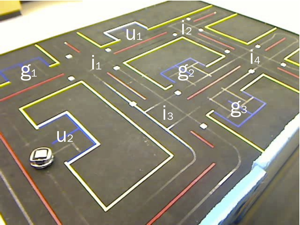 In dynamic vehicle routing, robots must make real-time motion planning decisions to complete spatially distributed tasks. Demands for service (or tasks) arrive sequentially over time. Each tasks consists of a random location, and requires on-site service by one of the vehicles. The vehicles are notified of each task upon its arrival. The goal is to minimize the expected time between a task arrival, and its service completion. In many real-world applications, such as surveillance, different tasks have different priority levels. In this case, vehicles must bias their effort towards higher priority tasks. For this problem we have developed an algorithm which is guaranteed to perform within a known constant factor of the optimal algorithm. The algorithm is shown in the video on the left for two classes of tasks. Yellow tasks have a priority level of 0.8, and grey tasks have a priority level of 0.2. Vehicle plans shortest paths through sets of tasks, and then update in a receding horizon fashion. For more information, see our work on dynamic vehicle routing with priority classes. Another important problem in robotics occurs when vehicles have different capabilities, and tasks may require several of these capabilities to be present simultaneously. For example, we may have some vehicles equipped with video cameras, while others are equipped with an infra-red sensor. If the vehicles are performing environmental monitoring, then some objects on the ground may require only video footage, while others may require simultaneous video footage and infra-red sensing. One solution, is to simply equip each vehicle with every type of sensor. However, this limits the throughput of the system, since some tasks require only a single sensor type to be present. This describes the dynamic team forming problem. For certain models of task arrivals and compositions, we have developed algorithms with performance guarantees. 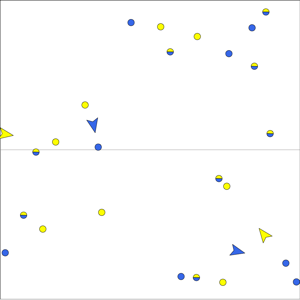 One such algorithm, based on a team forming schedule, is shown in the video on the right. There are two types of vehicles, yellow and blue. There are three types of tasks, one that requires a yellow vehicle, one that requires a blue vehicle and one that requires a yellow and blue vehicle together. For more information, see our work on the dynamic team forming problem. We have also looked at dynamic vehicle routing for moving targets. We considered the problem where targets arrive sequentially along the top edge of the environment. The targets translate downwards at a speed less than that of the vehicle. We have determined conditions for stability: That is, conditions on the target arrival rate and speed for which the vehicle can service all targets. 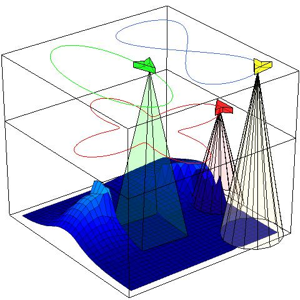 Our algorithm is based on computing translational shortest paths through the outstanding targets. We have shown this algorithm to be near optimal in terms of stability. The two videos show our algorithm for different target speeds and arrival rates. In the left video the targets have relative speed 0.2. In the right video the relative speed is 0.6. For more information, see our work on dynamic vehicle routing with translating demands. An important problem in security applications boundary guarding. Here, targets arrive along the top edge of the environment, and try to reach the bottom edge. A single vehicle traverses the bottom edge (the boundary) and tries to intercept as many targets as possible. 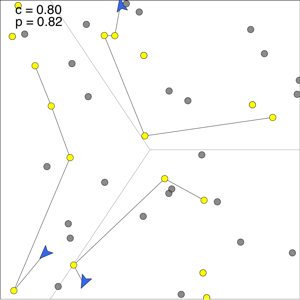 It turns out that this problem can be converted into a computation of a longest path in a directed acyclic reachability graph. Based on this, we have developed a receding-horizon algorithm with strong performance guarantees. The method of converting a problem to a longest path computation appears to be quite powerful, and shows promise for a broad class of problems. The left video shows a situation where each target moves directly towards the boundary. The right video shows a situation where targets randomly select directions at which to approach the boundary. 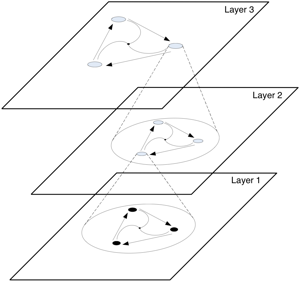 A central problem in distributed robotics is that of task allocation; robots must divide a set of spatially distributed tasks among themselves, and then complete each task. As an example, for an uninhabited aerial vehicle, a typical task might be to go to a location and obtain video footage of an object on the ground. One factor that is present in many applications and can significantly complicate task allocation is that robots have limited communication range and communication bandwidth. The goal is to minimize the time until the final task location is reached. We have shown that a key factor in this problem is given by comparing the communication range to the environment diameter. When this quantity is small, communication is sparse. When this quantity is large, communication is prevalent. The algorithm shown in the figure to the right (click to see a video) performs within a constant factor of the optimal algorithm under sparse communication. We have also developed an algorithm which is near optimal when communication is prevalent. 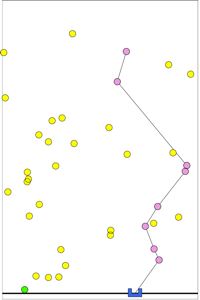 This second algorithm also completes the task allocation when target locations are unknown and must be found using limited range sensors. For more information, see our work on monotonic target assignment, or these summary slides from ICRA 2008. In multi-agent research, a problem which has received a great deal attention over the last decade is called the consensus problem. In this problem, each robot has an initial state. The goal is for the agents to communicate with each other in order to reach consensus on the average value of these states. That is, each agent would like to obtain the average value. One of the simplest approaches to this problem is called cyclic pursuit. I introduced variation called hierarchical cyclic pursuit which substantially increases the rate of convergence to the average. The figure on the left depicts the structure of hierarchical cyclic pursuit. In the bottom layer groups of agents perform cyclic pursuit. 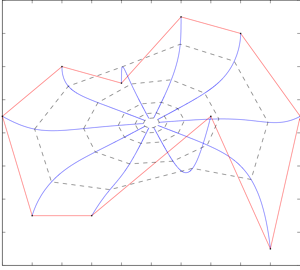 However, each group controls its centroid such that at the next layer, the centroids are in cyclic pursuit. This can be extended to as many layers as required, at the expense of more communication links. For more information on this work, see hierarchical cyclic pursuit. Consensus can be used to drive a set of robots to a common meeting point, or to rendezvous. However, in this application, one would like for the robots to rendezvous in an orderly fashion, without collisions. This is not a criterion in must consensus algorithms. Based on this I introduced a curve shortening approach for rendezvous, which guarantees an orderly meeting. The figure on the right depicts an evolution under this controller. 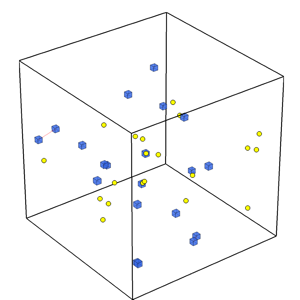 The vertices of the red polygon are the initial robot positions. 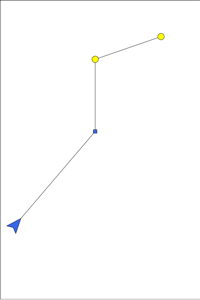 The blue curves show the robot trajectories, converging to a meeting point. The dashed polygons show the polygon evolution, whose properties are akin to a curve shortening flow. For more information on this work, see curve shortening and the rendezvous problem. In mutli-robot systems, it is often desirable for the robots to travel in formation. This avoids collisions, and guarantees communication connectivity. It turns out that designing a controller which globally stabilizes to a desired formation is quite difficult. 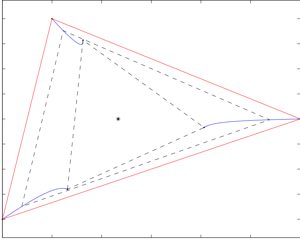 I have looked at this problem, and designed a controller for stabilizing to an equilateral polygon formation. In the case of three robots, the controller is guaranteed to globally stabilize the vehicles to a desired equilateral triangle. The figure on the left depicts an evolution under this controller. The vertices of the red polygon are the initial robot positions. 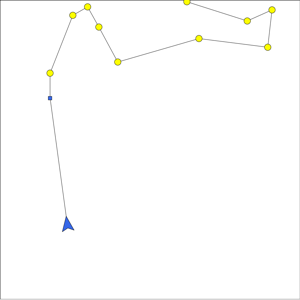 The blue curves show the robot trajectories, converging to the desired equilateral triangle. The centroid of the robot position is invariant under this controller. For more information on this work, see multi-agent formation stabilization.